This painting of “Erwachende Germania” (Awakening of Germania) symbolized efforts of the mid-19th century to unite German states into a second empire. In this 1849 painting by Christian Köhler, he depicts an allegorical “Germania” as a female warrior, awakened from her slumber by the approach of an evil power. She protects the old German Imperial crown of the past with one hand and reaches for her defensive sword with the other hand. Protective spirits float overhead, one holding the scales of justice, the other one holds the proposed flag of a future re-united Germany. Germany’s first empire, the Holy Roman Empire, was created in 800 by Karl der Grosse (Charlemagne). After a period of weakening, the Empire was reconfirmed in 962 by Otto I, who excluded France from the Empire. After existing for 1000 years, the Holy Roman Empire of the German Nation… under the leadership of Austria for its last 369 years… was dissolved in 1806, after its defeat by Napoleon at the Battle of Austerlitz. Germany was split apart and ruled by France for 7 years, until the successful Freedom Wars of 1813. From then on, for the next 58 years, there was a general yearning for a new German Empire and a period of growing nationalism ensued. The dream of a rebirth of the German Empire was eventually realized when Prussia permanently replaced Austria as the most important German state. 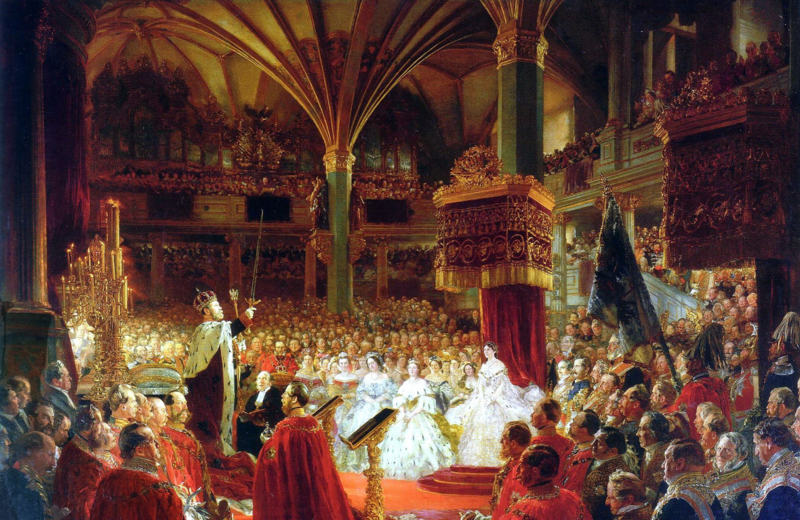 Prussia then fulfilled the dream in 1871 by first defeating the French Empire of Napoleon III and then using France’s Versailles Palace to proclaim the creation of a new united German Empire. This creation of the second Deutsches Reich unleashed an era of peace and prosperity that lasted for 43 years, until WWI. However, the proposed flag in this painting… black,red and gold… was not adopted until the Weimar Era of 1919 to 1933 and again by post-war Germany, from 1949 until today. Instead, in 1871 the flag colors became Schwarz, Weiss, Rot…meaning black, white, red…derived from the combination of the Prussian black and white flag with the white and red flag of the North German Hanseatic League. These.flag colors were used from 1871 until 1919 in horizontal stripe format, and from 1934 to 1945 in a different format of red background with a white circle and a black hooked-cross in the center.